Our department is committed to inspiring mathematics in young minds through outreach activities at the departmental, faculty and university level. In addition, our faculty members play an active outreach role in the community both locally and nationally. The following are some activities members of our faculty are involved with. These are open to the general public and various age groups. Get involved and be inspired! Math Circle students sharing solutions. 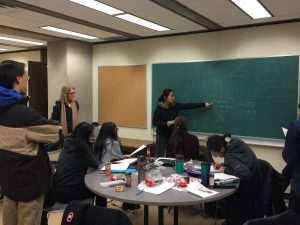 In addition to the items listed above, which are open to everyone, members of the department are also involved in a number of math-related activities that are directed at specific groups. Many of these activities are undertaken in cooperation with the Canadian Mathematical Society (CMS). The department is currently home to the Canadian Mathematical Olympiad Committee of the CMS. 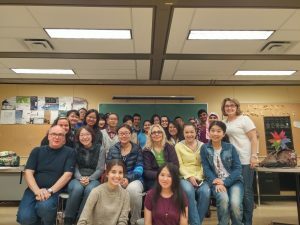 The committee is responsible for selecting and grading the questions for the annual Sun Life Financial Canadian Mathematical Olympiad competition, to which about 80 of the top Canadian pre-university math students are invited. For over 15 years, York has hosted the annual Winter Training Camp of the International Mathematical Olympiad Committee of the CMS. Each year, the committee invites twelve to fifteen top high school students who are viewed as the most promising contenders for the six members of Canada's International Mathematical Olympiad (IMO) team. The IMO is held each summer in a different country. The Winter Camp students stay at York for five days of intensive competition training. Each summer, York hosts a five-day daytime math camp, as part of the CMS' Math Summer Camp program. The camp is for students in 9th grade, and it is only by invitation of the organizers. In 2015, York assisted in the nation-wide grading of the Canadian Open Mathematics Callenge, and we anticipate that our involvement will continue. This contest is open to all high school students; registration is through the student's school. Top Canadian participants are invited to write the Canadian Mathematical Olympiad (see above).